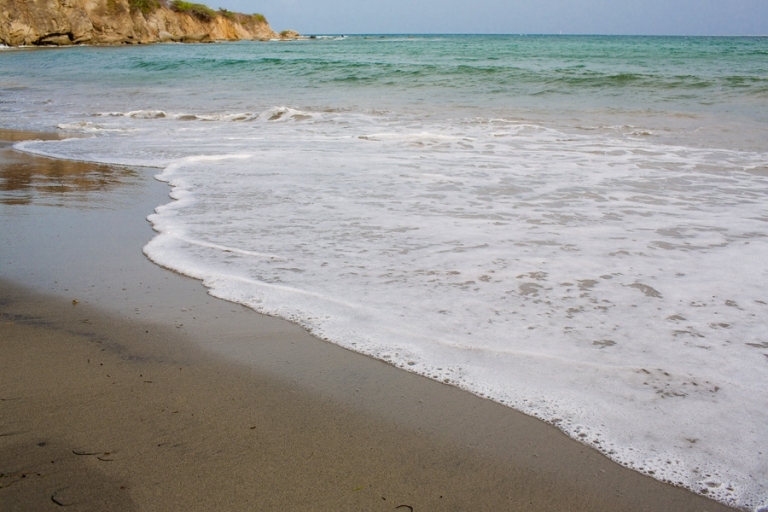 One of the reasons we were super excited about our trip to Vieques was for the abundance of famed beautiful beaches. During my initial research, I had read about the varied coastlines around the island and I was eager to explore each one – the picturesque soft sands and clear water at La Chiva, the volcanic black sand of Playa Negra, and even the rocky landscape of the small beach right behind Villa Chavaniac where we were staying for the week (pictured below). On our first full day, we pointed our trusty Jeep Wrangler down a bumpy road straight for La Chiva to experience postcard-worthy panoramas. Our cargo space carried folding chairs, towels, sunscreen, and all of the essentials for a day on the beach. However, when we arrived at Blue Beach, we found massive amounts of seaweed (specifically sargassum) lining the white sand and collecting in the shallow water. We popped in and out of different entrances to La Chiva and found each section pretty well covered in seaweed. No matter though, we figured another beach nearby might be a better spot. We checked out Pata Prieta and Caracas, but found the same situation. In some areas the seaweed was even piled up several feet high. Not to be deterred, we set out the following day in search of our perfect beach. We headed west to find Punta Arenas, and we discovered a clear expanse of sand and water free of seaweed. Score! And snorkeling in this spot was pretty decent. A short swim down the shoreline rewarded us with a small batch of healthy coral and colorful juvenile fish. 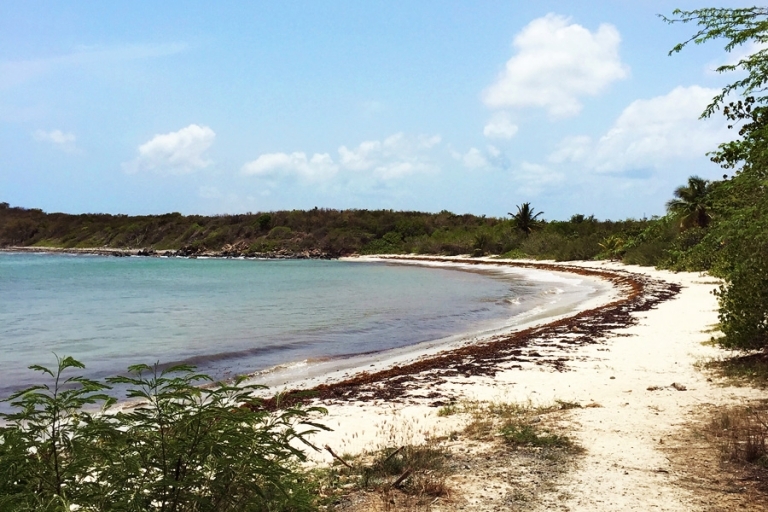 Mid-week, Chris and I drove by Gallito Beach on the north side of the island. It was lightly sprinkled with seaweed, but not too bad at all. We didn’t swim here – I was simply looking for good beach photo ops. Check! Playa Negra, a short hike from the road along a clear trail, wasn’t the blackest black sand beach I’ve ever seen and we didn’t end up swimming there either, but it was incredibly beautiful nonetheless. It was also the perfect spot for a few portraits. Esperanza Beach along the south side of the island seemed to be a popular choice for locals and tourists alike. I’m not sure what the pattern is with the seaweed, but this seemed to be one of the only southern areas that wasn’t plagued quite as much as the other beaches. On our last full day Chris and I hung out at the house for a low-key day, but my sister and Arne kept exploring and finally found their perfect beach in Sun Bay, which is also along the southern shore. The soft sand was free and clear of seaweed, and the clear turquoise shallow water stretched out before them without a trace of sargassum. I don’t claim to be any kind of botanist, but from what I’ve read sargassum shows up in cycles at various times in the year for multiple reasons (tradewinds, tides, changes in temperature, etc.). We encountered it in Belize as well. Here’s an article that goes into some details about the weed, includIng some of its benefits to the environment. 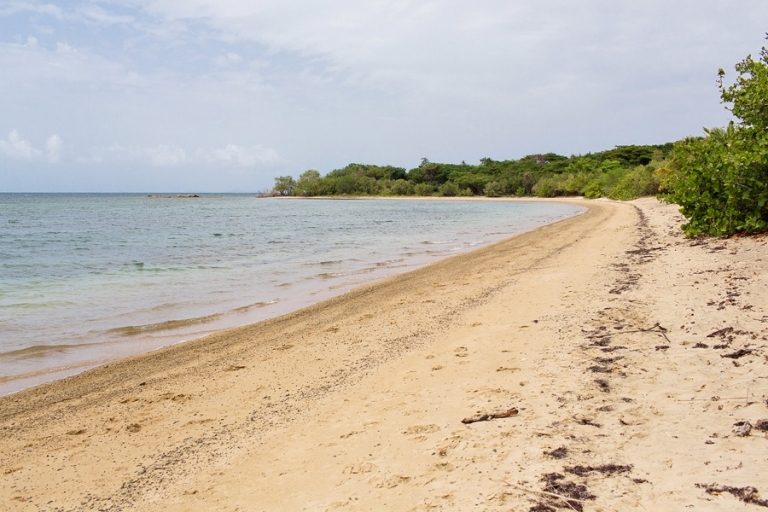 It doesn’t sound like there’s any way to predict it well in advance like when you’re in trip-planning mode, but if you do visit Vieques at least you can rest assured there are tons of beaches to choose from, and chances are good you’ll find an amazing spot as long as you’re up for the adventure of looking for it. For us that was part of the fun! The moral of the blog post/story is if you don’t find your perfect beach on the first try, keep exploring!